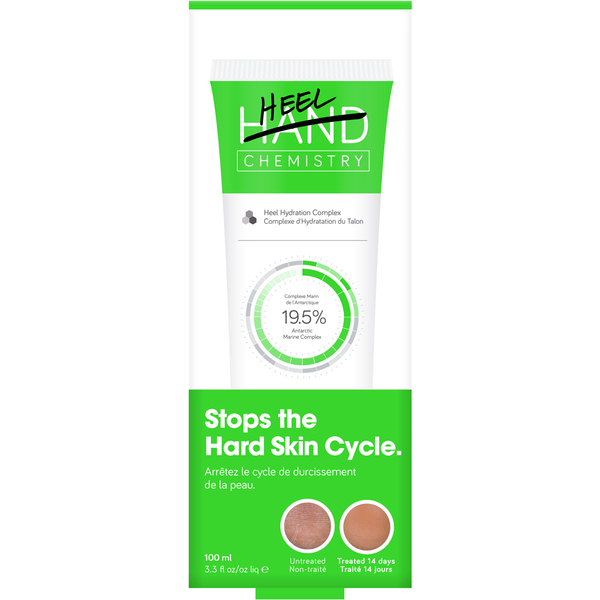 The Chemistry Brand Heel Hydration Complex is designed to hydrate cracked skin topically, whilst rebalancing hydration from below the surface to prevent the traditional hard skin cycle. Containing a 19.5% active complex which includes tramella fuciformis, a biotechnological derivative of the mushroom which has shown to be 400 times more moisturising than hyaluronic acid, the cream also contains soothing, purified calendula extract and maize propanediol, which forms a hydrating barrier over your skin to lock in moisture. Designed to increase skin hydration by 90% in 14 days, it'll allow you to say goodbye to cracked heels, hands and elbows. - L.M. water (aqua), propanediol, caprylic/capric triglyceride, cetearyl alcohol, cetearyl glucoside, cyclopentasiloxane, cetyl alcohol, glycerin, tremella fuciformis sporocarp extract, cellulose, pseudoalteromonas ferment extract, calendula officinalis flower extract, alanine, proline, serine, tocopherol, glycine soja oil, dimethicone/vinyl dimethicone crosspolymer, sodium polyacrylate, menthol, betaine, xanthan gum, caprylyl glycol, potassium sorbate, acrylates/c12-22 alkyl methacrylate copolymer, ethyl menthane carboxamide, hydroxypropylcellulose, menthyl lactate, propylene glycol, methyl diisopropyl propionamide, ethylhexylglycerin, sodium phosphate, sodium hydroxide, chlorphenesin, phenoxyethanol, fragrance (parfum), citral, coumarin, geraniol, limonene, linalool.